Meatball Stew is an easy twist to the classic red stew that uses juicy meat balls instead of the lumps of meat we normally use in our stews. 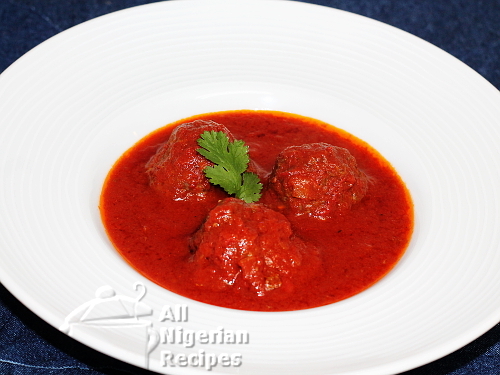 Meatball stew like Corned Beef Stew is commonly used to eat boiled white rice, boiled pasta (spaghetti, macaroni), boiled yam and boiled potatoes. You can even add big chunks of carrots and potatoes into the stew to make a meal you can eat on its own. Tomato Stew is fresh tomato puree and tinned tomato paste that has been boiled and fried to remove all traces of water and the sour/tangy taste of tomatoes. Please note that this stew does not contain spices or seasoning. It only contains tomato puree, then onions and vegetable oil that was used in frying it. I cannot stop talking about how always having tomato stew in my freezer saves me lots of cooking time. In Nigeria, we have a vegetable known as curry leaf. A close alternative is fresh basil. Add curry leaves if you want to add some vegetables to your Meatball Stew. Since curry leaves are very tiny vegetables, no need to slice them before adding to your Meatball Stew. Just pick from the stalk and add to the stew when you are ready to take it off the stove as detailed below. Since basil leaves are broader, you may need to slice those ones into small pieces before adding. If using the big stock cubes, use one and half. If you do not have meat stock on the day you prepare this, just add water. Meat stock is the water you get from cooking meat. For the best taste, use a mixture of minced beef and minced pork in equal amounts, that is if you eat pork. If not, buy the juiciest part of beef. In Nigeria, you can buy minced meat in foreign supermarkets such as Spar and Shoprite. I usually prepare large quantities of tomato stew and store in my freezer. That way, I can prepare such recipes as Meatball Stew in no time. All I need to do is bring out the stew early enough to defrost and food is ready before you can say meat balls lol. Peel and pound the garlic in a mortar. You can also use a garlic press. Pick the curry leaves from the stalks and rinse well if you will be using it. Put the minced meat in a bowl. Add crushed garlic, 1 teaspoon of thyme, 1 teaspoon of ground black pepper and 2 small stock cubes (crushed) to the minced meat. If using big stock cubes, add 1 at this time. Mix well with your hand till everything is well incorporated. Set your oven to 200°C (400F) to preheat. Mold the minced meat into small balls, a bit bigger than table tennis balls. When molding, do not press too hard so that the meat balls will not be rock solid when done. Just use your finger tips to gently form the balls. I usually get 10 meatballs from 500g of minced beef. 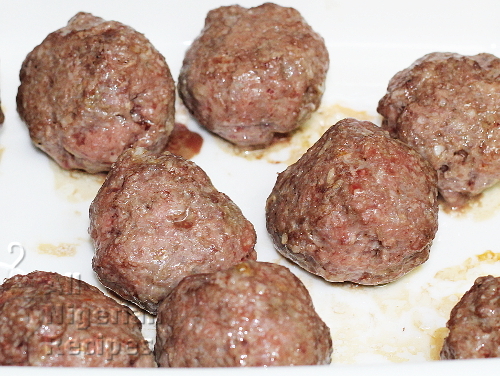 Click the raw meat balls image to enlarge. Place the meatballs in an oven tray and bake in the preheated oven for a total of 20 minutes. 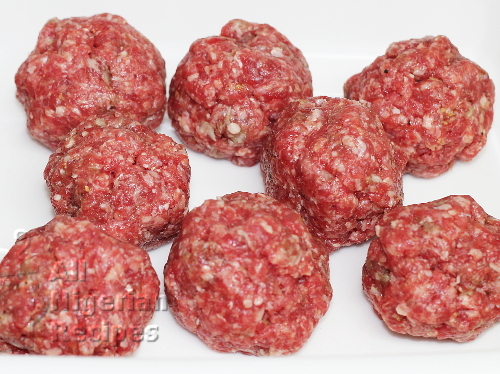 While baking, turn the meat balls around at least once so that they will cook evenly. You can also shallow fry them but I don't like doing that because for me, the meat balls are not evenly cooked when fried. Fry if you do not have an oven. 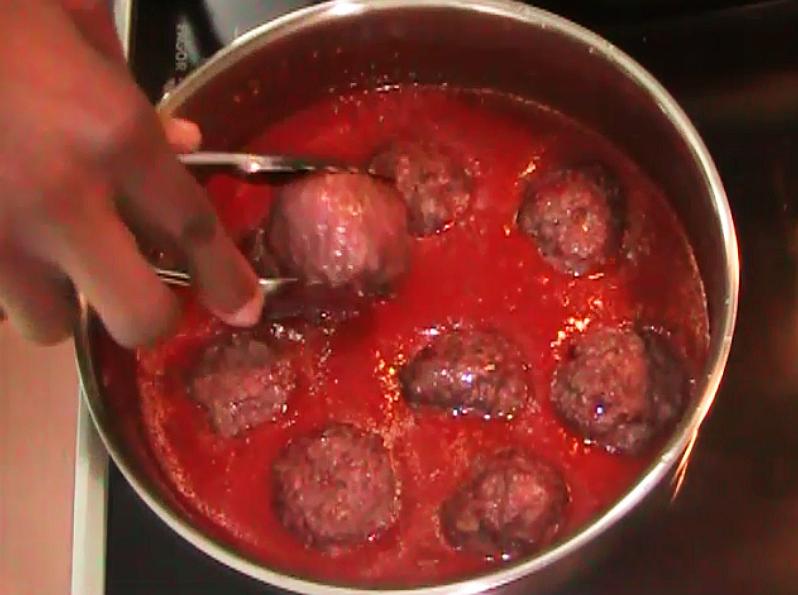 This is what the meat balls should look like when done. Click the image to enlarge. Set a pot on the stove and add the conc. Tomato Stew. Add the meat stock. The consistency of the tomato stew should be medium. If you do not have meat stock, just add water. Add the remaining thyme, ground black pepper and stock cubes. Then add salt to taste. Stir very well and gently add the baked meat balls one by one into the stew. Cover and leave to simmer on LOW heat so that the stew will slowly come to a boil. Once it heats up very well, the Meatball Stew is done! If you are using curry leaves or fresh basil, add them at this time, stir and take the stew off the stove. Serve with the following staple food of your choice: Pasta, White Rice, Boiled Yam, any pasta (spaghetti etc) and Boiled Potatoes.